Do The Goonies need any introduction? Well they probably do if you weren’t old enough to watch the 1985 film which followed the efforts of a bunch of kids to save their homes from demolition and discover some pirate gold in the process; this online slot from Blueprint Gaming brings that adventure to the reels along with plenty of extra features as you can discover below. The Goonies is a five reel slot with three rows and twenty fixed paylines; there are sound effects galore from the film as you spin the reels against a backdrop of One-Eyed Willy’s treasure map and a sprinkling of gold coins. The five high value symbols are the stacked skull and crossbones, a treasure chest, One-Eyed Willy’s pirate ship, a skeleton and a set of scales; J, Q, K and A make up the lower values. The silver coin is wild and it will replace all others to help form winning combos except for the One-Eyed Willy skeleton scatter symbol. Fratelli Hideout – pick a key to reveal a cash prize, the end of the round or one of the other features. Skeleton Organ – keep picking organ keys to collect bet multipliers, upgrade those values or trigger another feature with three keys. Three skulls and crossbones ends the round. Super Sloth – awards free spins on a set of reels based on the Fratellis; here landing the Super Sloth Wild will turn any Fratelli symbols in view into the most valuable ones. When the round is over choose a chest to reveal more spins, the end of the round or One-Eyed Willy’s Treasure Bonus. 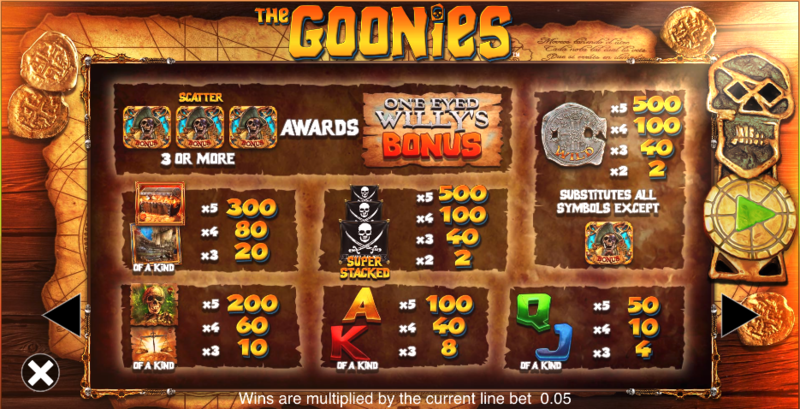 Goonies Go Wild – awards free spins with one high value symbols turning wild after each spin; when the spins finish pick one of the Copperpot Doubloons to reveal more spins, the end of the round of One-Eyed Willy’s Treasure Bonus. Inferno Free Spins – awards free spins with the Inferno turning between one and three adjacent reels wild on each spin; when the spins finish spin the wheel to reveal more spins, the end of the round of One-Eyed Willy’s Treasure Bonus. One-Eyed Willy’s Treasure Bonus – get here by landing five triggering symbols, via one of the above mentioned feature routes or by gambling you way up after the first wheel spin. Collect win multipliers until the booby trap hits the scales at which point the round is over. Truffle Shuffle Wilds – wilds are added to the reels. Mikey’s Hidden Riches – reels can become completely wild. Data’s Colossal Symbols – three adjacent reels become one giant symbol. Mouth’s Lucky Coins – gold coins stick to the reels and transform into a matching symbol when the spin ends. One-Eyed Willy’s Bonus Boost – extra scatters are added to the reels. Sloth’s Win Spin – guarantees a big win. 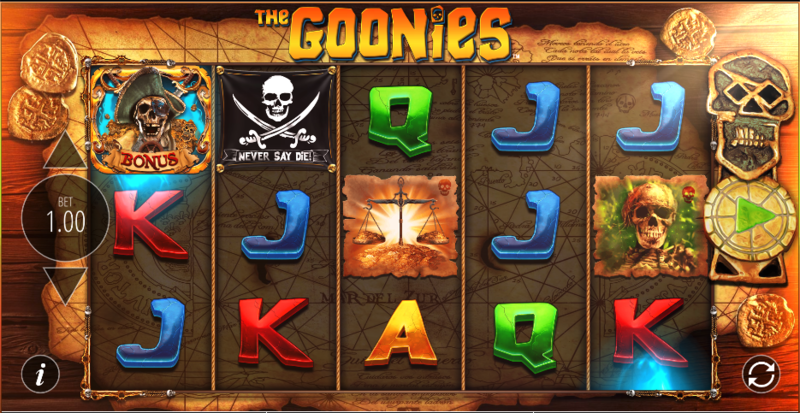 The Goonies is a slot which does a great job of bringing all those famous characters to the reels and they all get their own well-designed features in the process; this is definitely a game for those who appreciate bonus features!